Bank of India (BOI) is public bank owned by Government of India. It was formed in 1906 and recently completed 110 years of excellence. 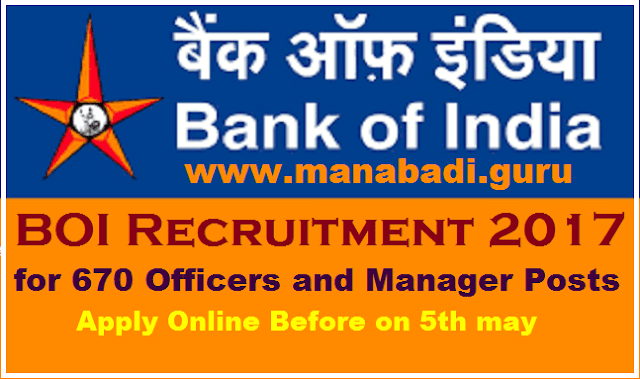 Bank open 670 new vacancies for Officer and Manager. Before talking about this vacancy please visit www.bankofindia.co.in website to know about bank, corporate profile, services, announcement, career, recruitment and plenty more information. Candidate interested in Bank of India Officer Recruitment 2017 2018 should have A Degree (Graduation) in any discipline with minimum 60% marks alongwith MBA/PGDBM/ PGBM/ PGDBA / Post Graduate or in Commerce/ Science /Economics OR Chartered Accountant OR ICWA. All Eligible and Interested Candidates may apply Online through Official website http://www.bankofindia.co.in on or before 5th May 2017. The above tests except the Test of English Language will be available bilingually, i.e. English and Hindi. The test of English Language will be of qualifying nature i.e. Marks obtained in English Language will not be added while preparing merit List. Qualifying marks stipulated above are for General Category candidates. Candidates belonging to the Reserved Category (SC/ST/OBC/PWD), filling in vacancies reserved for the relevant category, will be entitled to a relaxation of 5% marks in relation to that stipulated for general category candidates.